I guess I spoke too soon in my post on Saffola Masala oats. Maggi is indeed associating with “health” tags as well, and their recent launch of oats nutri-licious noodles is the proof. The ad carries all the messages linked to health, conveyed using a contemporary plot. An independent daughter is chatting with her mother through a video call. While she is making breakfast, the mother is worried about her exercise and eating habits. And she insists that she should atleast have a good breakfast. 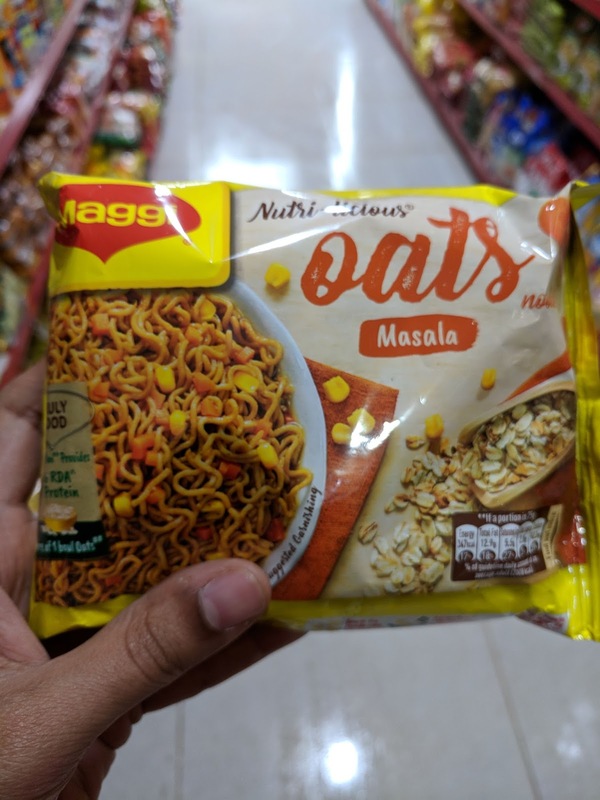 The daughter immediately shows her bowl of “oats Maggi” and the mother is stunned. I had the same expression too on my face, while watching this ad - “good breakfast” translates to “oats Maggi”? Can it get any worse than this? The nutrition information shows that a pack of 75 gm has a meager 4 gm of fibre. 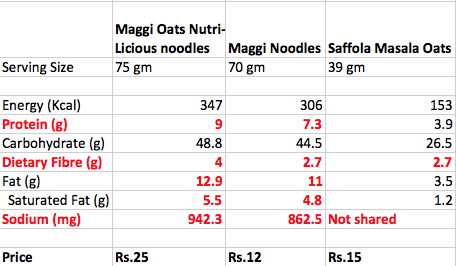 As you can see from the comparison table, it is slightly higher than that of regular Maggi noodles but not significant. Reiterating the fibre present in a few fruits for comparison - A medium sized pear has 5.5 gm, a medium sized banana has 3.1 gm, 100 gm of guava contains 5.4 gm of fibre. 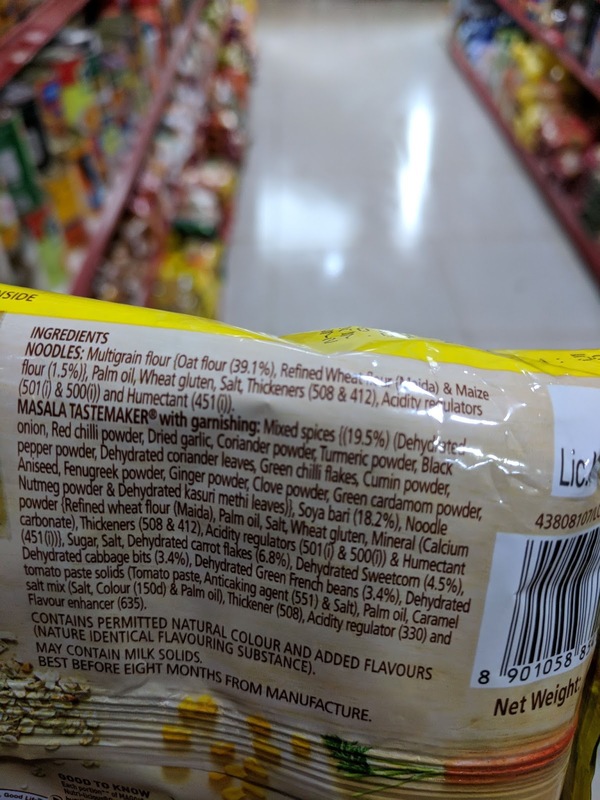 The ingredients list shows that a pack of 75 gm has multigrain flour, in which oat flour contributes only 39.1%, maize flour 1.5% and of course, there is refined wheat flour (maida) as well, for which the percentage has been conveniently left out. Why are we falling for the oats trap repeatedly? The nutrition information shows that a pack of 75 gm has 9 gm of protein. 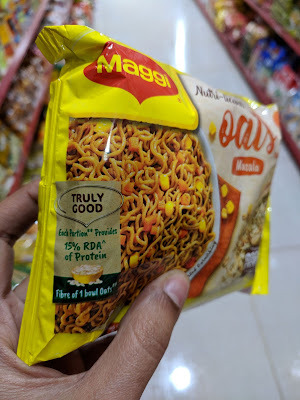 As you can see from the comparison table, it is slightly higher than that of regular Maggi noodles but not significant. The vegetables that are added in meagre quantity are all dehydrated, which doesn’t provide any nutrition whatsoever. They are just added as an eye-wash, to make us believe that we are eating something healthy. Is it that hard to chop and steam-cook a handful of vegetables? And most importantly, the fact that is not highlighted in the ad but shown clearly in the packaging is the “high sodium” factor. The ideal limit of sodium is 1500 mg per day. American Heart Association has set a maximum limit of 2300 mg per day. We consume sodium through various foods - home cooked foods where limited salt is added and packaged foods that are usually high in salt for increased taste and preservation. A serving of Maggi oats noodles has 942 mg of sodium. It is very easy to exceed the daily limit if such noodles are consumed on a regular basis. What about the numerous additives, preservatives and flavour enhancers added to this pack? Color (150d) => What’s synthetic caramel colour that’s usually added to Coco-cola doing here in a pack of oats noodles? Maybe, they wanted to give a whole-grain look to it. Flavour enhancer (635) => Ribonucleotides => causes severe rashes. More details on the side-effects of this flavour enhancer are listed here. Let’s not succumb to the false “health-tag” attached oats noodles and fool ourselves into thinking we are eating healthy. Let’s stop embracing such lazy short-cuts and start cooking fresh meals every single day. This message is intended for both the genders. A well researched post. Media these days brainwashes us with these healthy labels and lures us into a trap of unhealthy eating ( though we believe their labels and are under the false belief that we are eating healthy). We should teach ourselves to read labels and understand the hidden meaning and educate ourselves to take the right decisions. Thank you for the article again. I still wonder how could Maggi sneek in so much protein into the pack !! A false claims ?! Thank you Harshitha....Yes, there are no regulations on such claims and "health" oriented labels. We need to educate ourselves on what goes behind such products, without blindly believing these claims. And yes, the ingredients listed are only the tip of the iceberg. I was searching for this post as I have switched to Maggi Oats, Maggi Atta, Horlicks Foodles since long . The label however says Wheat Flour and not Refined Wheat flour. Wheat flour and refined wheat flour both refer to maida. Unless and until the pack explicitly states "whole wheat flour", they always refer to maida. Buy plain hakka noodles if at all you want to make it occasionally.